JSC ALFA is a full-service electronics assembly company specializing in complete turnkey and consignment printed circuit board assemblies and box-builds. 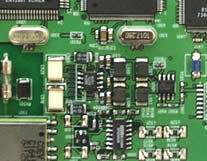 As an experienced and reliable contract manufacturer JSC ALFA provides the most complete and cost-effective PCB assembly facilities in the EMS (Electronic Manufacturing Services) industry, providing the full product life cycle from PCB design and engineering to high volume PCB production including materials supply, assembly, quality control, testing and selective conformal coating services. Production area and equipment fit with strictest standards of electrical protection. Storage area for components keeping and floors with antistatic coating are connected with "earth" which represents a very important characteristic during the work with SMD components and this fact has a great influence on the end product quality. 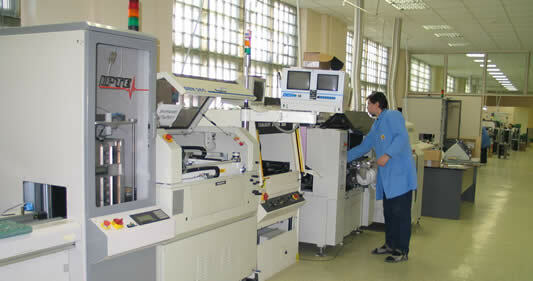 Personnel works in the special clothing and foot-wear and use the antistatic bracelets. Before the entrance into the workshop personnel pass test to the absence of static electricity. Automatic SMD Pick&Place component mounting with possibilities to set up BGA, mBGA, Fine pitch, Flip chip, CCGA, PLCC, QFP, CHIP, TSOP, SOIC, SOT, SOD, MELF, SOP, SOJ, 0402 SMT Devices. JSC ALFA has strong strategic partnership with international electronic components distributors. So we can offer you to find almost all components you need. Every electronic device needs Printed Circuit Board. We represent one of the biggest PCB manufacturer in South East Asia, and can offer you the lowest prices and the highest quality.